Why don’t they make medicines that look like this? Why? I love this website! Thank you so much! I check it multiple times a day! 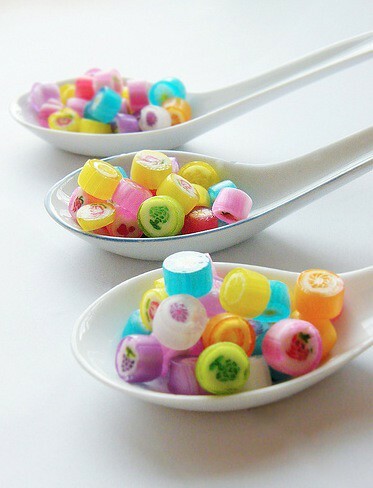 My doctor would give me pink medicine to swallow and it tasted (almost) like the lollies in the picture. My psychiatric medicine, on the other hand, tastes like nothing. The vitamins, especially Vitamin D, taste like something. And NATIONAL NOVEL WRITING MONTH! I think taking 8 pills every day would be less tiresome if they had little flowers and stuff on them. Perhaps the pictures could relate to what the meds do? Like, the ones I take to help me sleep could have a little owl on them, the ones for depression a rainbow. OM NOM NOM. I’m just afraid they aren’t for vegetarians. I always have trouble with meds because I refuse to take anything with gelatin in it. Also: Happy Reformation Day (yes, it’s a holiday where I live)! No Halloween for me, thank God, but I managed to forget to go grocery shopping yesterday and now I have to go to the station at noon, just like everybody else in my 250k city who forgot it. It’s going to be hell. I hate busy crowds. And crowds in general. On the bright side, this means sushi and Subway for dinner. Also, I just finished my first ever Yuletide letter! Hopefully I won’t scare whoever reads it with my lengthy monologue. That blog is PRECIOUS. Everything is made with such care! Today I began to think about all the stupid ableist things my dad has said to me and it made me so angry that I couldn’t sleep. (My current sleep schedule is such that I sleep through the afternoon… but today I stayed up until 9 pm.) So I made a list of things you shouldn’t say to a depressed person. It made me feel a little better. I would so be happier to take meds if they looked like that. Speaking of meds, I FINALLY found a doctor who didn’t shrug off my giant daily doses of Aleve and is willing to treat my chronic daily, often debilitating, headaches! 😀 She wants to wait until after I see the psychiatrist next week for my anxiety in case he puts me on any meds–don’t want to risk nasty interactions. I am SO FILLED WITH GLEE. I want medicine that looks like that. Sweets that look like that would do. But they’re so pretty, I’m not sure I could bring myself to eat them! .-= Anji´s last blog ..Seventh Carnival of Feminists =-. Mostly, I just want medicine that doesn’t make me sick. I’ve been throwing up for the past few days, and I think it might be because of the codeine. Which means it might be time to try yet another new painkiller. Adelaide Dupont: That’s strange, my Vit D tastes like nothing… Probably because they are gel minicaps. Makes them nice and easy to swallow, and if I poke them with a pin, gooey stuff comes out! Also, NaNoWriMo! Yay! This is the first year I’ve signed up. Have you singed up? I am totally late to the party here, but what is everyone doing for Halloween? Inquiring minds want to know! .-= meloukhia´s last blog ..What’s The Difference Between Costuming and Appropriation? =-. My 7 yr old may well expode if I don’t gather up the gumption to get showered and dressed and out of the house for Halloween fun. I can smell her patience burning off. She dressing as a sock-hop poodleskirt girl. From the grave. The last part was entirely her idea. Speaking of kids and meds, what’s really alarming is that most medicine-related poisonings of kids are from vitamins. They’re tasty and cute, and many people assume they’re innocuous. Not so in large amounts. Scary. My kid can reach my meds but not her vitamins. Of course, neither can I, so that’s Dad’s job. I’m off to a party that I’m sort of second-hand invited to, and will be happily genderbending as the Tenth Doctor! I really want a cupcake, right now. I am going to blame this on the executive function issues, but I just realised that I was thinking of participating in NaNo but somehow entirely missed the fact that it starts tomorrow. (I also forgot Halloween, but NaNo is ttly more important.) Probably for the best; I don’t think I’ll have the spoons to spare, and none of my possible-novel-ideas are *near* developed enough for this. I will try to write more than I usually do anyway, and maybe work on that darn WIP that has been lying abandoned since May. .-= Kaz´s last blog ..Slang and what it says about you – linguistic digression =-. So at 3, the fire alarm goes off. And then at 12 something (it’s Saturday, I was asleep). There was ableist graffiti in one of our elevators this week – it’s gone now, probably not because it is mean, but because it’s writing. I wish I had spoken up, but I’m glad it’s gone. How would I feel if I was exhausted, unsteady on my feet, and saw that on the elevator after waiting 5-10 minutes for it? Especially if I wasn’t alone on the elevator, and the other people were the “right” people to use it (higher floors)? I was just thinking…”what about people coming down from higher floors?! Surely even ableist bigots have some sympathy for people who don’t want to walk from, say, floor 15 to the second floor, whether or not they have disabilities!” What an odd and sad graffito. Adelaide Dupont: Nature’s Life makes a vegan vitamin D softgel. softestbullet: I’m thinking sugarcoat the pills and draw on them with edible dye, perhaps using a toothpick? Oh! Also, that picture reminded me of Happy Pills, a candy store in Barcelona. I dressed up for the first time in years—I was a tray of poutine. Food costumes are win. Now I have a lot of batting left over and am thinking of making a Prozac cushion. Seafoam green, creamy yellow, cylindrical…it could work! .-= Tlönista´s last blog ..links for 2009-10-30 =-. I got dressed up for all of 15 minutes for halloween, then decided that any party that required me to spend a week trying to figure out how to get myself and Don there wasn’t worth going to. I feel kinda bad, but wow is Halifax not the place to try and get around when a wheelchair is involved. But, for a few magical moments, I was the bustiest Dread Pirate Captain Stripey Socks you’ve ever met. .-= Anna´s last blog ..One simple rule =-. Now I am sooooooooo hungry. Poutine is the best worst-for-you food in the world. OM NOM NOM. Then again, I currently live in the country that invented the deep fried Mars bar so I *really* shouldn’t talk. DEEP FRIED CADBURY CREME EGGS? It’s a really good thing I am on the other side of the ocean. Otherwise…you don’t even KNOW. Deep-fried butter was available at the Texas State Fair this year. Because eating plain ol’ fat (albeit delicious fat) isn’t enough. I admit to being intrigued rather than revolted. I reserved revolted for bacon ice cream.